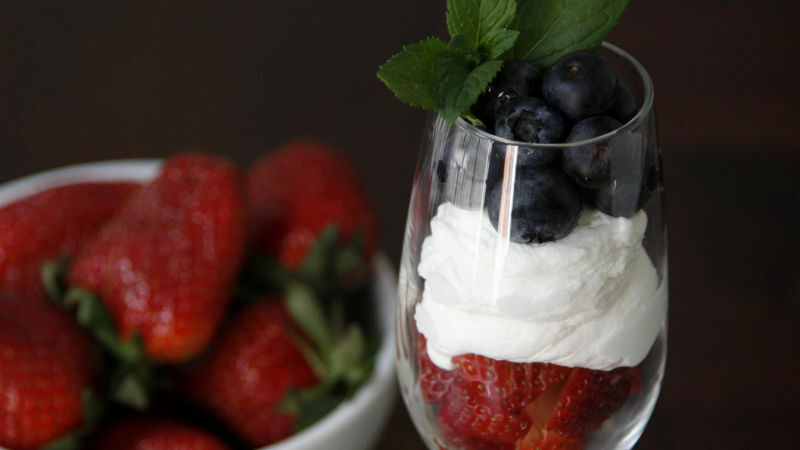 In each of 4 parfait glasses or wine glasses, layer strawberries, whipped topping and blueberries. Serve immediately or refrigerate until serving time. Garnish the parfaits with fresh mint sprigs for pretty presentation. Add a few drops of vanilla to the whipped topping for additional flavor. You can also whip and sweeten whipping cream instead of using purchased whipped topping. You may not use the whole container of whipped topping, depending on how generously you fill the glasses. Refrigerate any leftover topping for another use, or purchase extra berries to make additional parfaits. It’s easy to make many of these desserts to serve a larger group.